Today is the first Tuesday in November: Melbourne Cup Day. This is a gazetted public holiday in Victoria and an unofficial public holiday virtually everywhere else in Australia. While nearly all businesses in the South Burnett will attempt to trade as normal - and all government and public offices will be open for the daily grind - the majority of people will either be taking a bit of time out or abandoning any pretence of following a normal day's routine from about noon onwards. As usual, the South Burnett will be celebrating the occasion with a number of Melbourne Cup Day functions along with the Kumbia Race Club's annual Melbourne Cup Day Race Meeting (see entry immediately below) - a really great South Burnett bush race meeting that's become something quite special to all of us over the years. 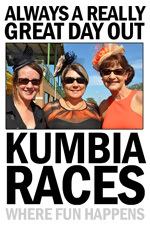 The Kumbia Racing Club will be holding its 46th Annual Melbourne Cup Day Race Meeting at the Kumbia racetrack from about 9:00am this morning through until 5:00pm this afternoon. This very popular 5-card event is the only live Cup Day race meeting in the South Burnett and it always attracts a great crowd. 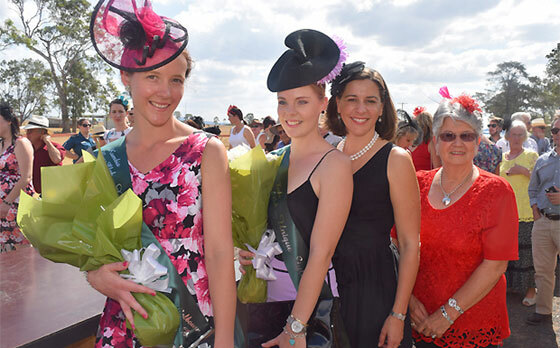 There'll be Fashions of the Field parade with great prizes. There'll also be a bar, BBQ, and the Luncheon Hall in operation plus full Sky-TV race meeting coverage, a vigorous betting ring, and big screen coverage of that other race meeting in Melbourne. The Kumbia Race Club's facilities got really pounded by the October hailstorm (just like the rest of Kumbia) but track officials have been working hard the past few weeks to effect repairs and ensure everything's ship-shape for today's meeting, so regulars should find everything they've come to expect from this terrific annual race meeting. Admission is just $10 for adults and $5 for concessions, and a bus will be running from Kingaroy's Carrollee Hotel for people who've booked seats at the pub. More details? Contact the Race Club Secretary on (07) 4163-7200. St Joseph's Catholic Parish will be hosting a Melbourne Cup Luncheon from 11:00am to 3:00pm today at St Joseph's Hall in Angel Avenue, Murgon. There'll be champagne on arrival plus sweeps and raffles, giveaways and Fashions of the Field. Cost is $20. Bookings are essential as numbers are limited. Phone Cecily on 0438-684-648 or Elaine on 0419-693-602. The Nanango RSL in Henry Street will be holding a Melbourne Cup Day Luncheon from 12:00 noon to 3:00pm today. For $35 per head, guests can get to enjoy a complimentary champagne on arrival, a sweep ticket, an antipasto plate and lunch, along with big screen coverage of the race and all the usual fun of a Cup Day get-together. There'll also be betting available through the club's UBET facility, and guests who only have an hour for lunch can get whisked through in style providing they book for four or more people. More details? Phone the RSL on (07) 4163-1375. A Melbourne Cup Day Lunch will be held at the Proston Cultural Centre in Rodney Street, Proston from 11:00am onwards today. For $20, guests can enjoy a great two-course lunch, a fashion parade by NB Inspirations, live entertainment and coverage of the race. There'll also be multi-draw raffles, sweeps, prizes for the best-dressed lady and gentleman and a lucky door prize. To plan the catering, though, bookings are essential. You can make one by phoning Graham on 0429-689-558 or Judith on (07) 4168-9540. The Wondai Neighbourhood Watch group will be holding a meeting from 7:30pm to about 9:00pm tonight at the Wondai Diggers Club in Mackenzie Street. All local residents are welcome to attend.